These days just about everyone involved with golf is aware that we need to bring new people into the game… and keep current players playing. Many professional golfers and golf organizations are now involved in initiatives to grow the game. As for the quintessential Golf Ambassador, without a doubt that would have to Dr. Haruhisa Handa. This Japanese philanthropist has been dedicated to growing the game of golf for almost 25 years. His International Sports Promotion Society has fostered partnerships with golf’s governing bodies worldwide to help develop the game at every level, advising professional tours, supporting their charitable efforts and sponsoring tournaments. Dr. Handa is the Honorary Chairman of the Legends Tour and an advisor to the European Senior Tour. He’s also Chairman of the Women’s Senior Golf Association and an official Patron of Golf Australia. In addition, Dr. Handa established the first Blind Golf Club in Japan, and is known to many there as the “Father of Blind Golf”. He serves as Honorary Chairman of the Japanese Blind Golf Association (NPO) and Honorary President of the International Blind Golf Association. He relentlessly promotes blind and disabled golf. Long before “growing the game” became a cause célèbre, this extraordinary man was supporting organizations and efforts that allow young people, those in their senior years, and people with disabilities... from various backgrounds around the world... to be involved with, and inspired by, golf. 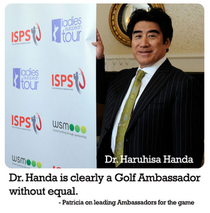 In my eyes, Dr. Handa is clearly a Golf Ambassador without equal. Reading Dr. Handa's bio, I don't know how I could disagree. He's supported the game in places and with populations that are usually ignored. The world needs more like him. The First Tee and their corporate partners come to mind as well. As I was reading it I thought, "Well, there is women's golf..." but then I saw that Handa has that base covered too. He should be an example to everyone in the golf industry. He sure does! His sponsorship of the Legends Tour is so awesome because even though it's a GREAT tour that includes the best women golfers in history... it's just really difficult to get people to sponsor senior women. Dr. Handa has sponsored the Handa Cup (US vs World) for years and recently committed agreed to continuing his title sponsorship of the event through at least 2013. For the European Senior (Men's) tour as well. Dr. Handa and his company are title sponsors of the new ISPS Handa Senior World Championship that was played at the at the World Cup Course in Mission Hills, China for the first time this past spring. And he does much more than that for golf... and for myriad other causes. He's truly a Renaissance Man who manages to stay "under the radar" while doing such great things. No matter what you think of his music, Justin Timberlake has got to be considered when your talking about a "Golf Ambassador". He loves the game, he saved an old golf course that was going be sold to developers - then transformed it to a eco-friendly course that welcomes families and expert players. Plus he sponsors a PGA Tour event. I wish we could get other golf crazy celebrities to do half of that. Founder of Golf Girl Media, editor at Golf Girl's Diary and author of Golf Girl's Little Tartan Book. ~ Living happily where golf meets new media.